March is National Nutrition Month. In 1973, the first National Nutrition Week campaign was launched with a presidential proclamation, along with advertising and news releases featuring the theme “Invest in Yourself – Buy Nutrition.” National Nutrition Week was embraced thereafter by the American Dietetic Association to educate the public about nutrition. Today we know a lot more about the importance of a healthy diet. Not only are certain diets better for your overall health, but they are also better for the health of your teeth. Here are some foods that will help promote healthy teeth and gums. Calcium has been shown to help build strong teeth, and Vitamin C is an antioxidant that promotes collagen synthesis for healthy gums. Foods that contain these nutrients include cheese and yogurt. There’s a lot to love about cheese, but what’s more to love is that it raises the Ph level in your mouth, which lowers the risk of tooth decay and prevents cavities. Plain yogurt, without added sugars, also benefits a healthy smile for the same reasons. Plus, yogurt is one of the best sources of probiotics, which may help to decrease gingivitis and plaque. Leafy greens, especially kale and spinach that are extra rich in calcium, are helpful in building your enamel. They also contain vitamin B, good for Epithelial cell turnover, and folic acid, which helps fight gum disease too. Although they are sweet, fruits, specifically apples, are high in fiber and water. The act of chewing an apple mimics that of brushing, which helps release buildup of bacteria on your teeth. Like apples, eating crunchy and fibrous raw carrots stimulates saliva, rinsing away bacteria in your mouth and lowering the risk of cavities. Similarly, munching on raw celery can scrub bacteria and food particles. It is also an excellent source of vitamin A and C.
Almonds are a great source of protein and calcium, which help keep teeth healthy and strong. Protein is essential for tooth structure, mucosal and connective tissue development and immune function. Calcium is equally important for tooth structure and strength and may also enhance enamel remineralization. Cranberries, blueberries and raspberries are rich in anthocyanins, which act as antioxidants and offer anti-inflammatory benefits. Eating foods rich in anthocyanins, including eggplant and red cabbage, may help prevent the attachment and colonization of pathogens on host tissues, including teeth. 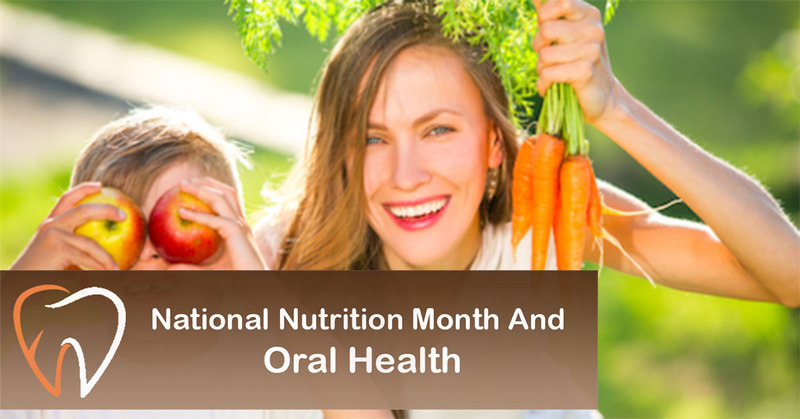 Because mucosal cells in our mouths turn over within three to seven days, nutrient shortfalls or excesses will show up in mouth tissue before they show up anywhere else on our body. Keep an eye on nutrition and your diet, and keep a healthy smile on your face.